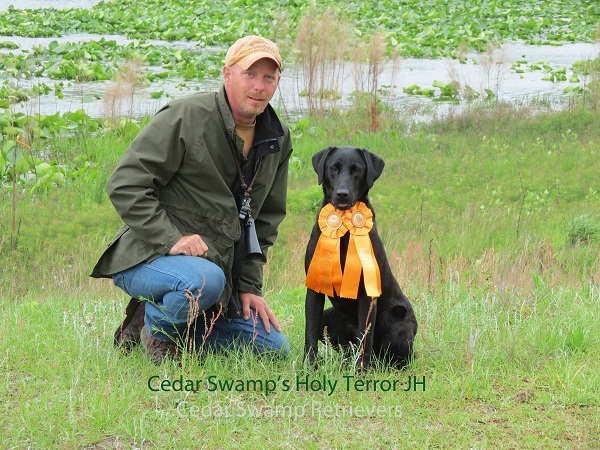 We train for hunting and AKC Hunt Test as well as HRC Hunt Tests. We tailor our training to meet the needs of the owner and the dog based on the dog's age, prior training, and natural ability. We will be honest and upfront with you about the abilities of your dog so that you and the dog get everything out of training that you can get. We have done a lot of "problem solving" with dogs that may have lost the desire to work. While these dogs may not achieve the highest titles, they can often be encouraged to return to hunting at a minimum. We believe in balancing praise and rewards with the least amount of pressure and fair corrections to crate a happy and enthusiastic retriever. The owner is also has a responsibility to learn how to work with his/her dog by training with us and learning how the dog operates...a well trained retriever is only as good as his handler's ability to perform with him as a team. Dogs are worked on REAL birds as this is what will be retrieved in the field as well as other training tools. 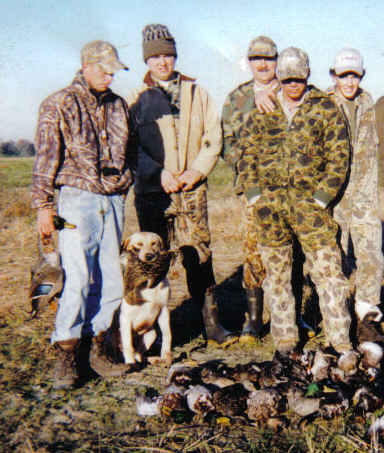 The hunting retriever is a great conservation tool resulting in fewer lost birds. A good retriever is great to have around. Solid obedience, delivering bird to hand, steadiness and quiet in the field and blind, blind retrieves and good handling all make for a good hunt. A true finished retriever is the best conservation tool you can invest in as you will lose almost no birds. HRC Hunt Tests are recorded by the United Kennel Club (UKC) and are very similar to the AKC tests. The levels in HRC tets are Started Hunting Retriever (SHR), Hunting Retriever (HR), and Hunting Retriever Champion (HRCH). Twice a year, is "The Grand", a week long national test to show "the best of the best". After successfully completing The Grand twice, the title of Grand Hunting Retriever Champion (GHRCH) is bestowed upon the dog. They also maintain "points" with passes and have a "500 Point Club" and "1000 Point Club". 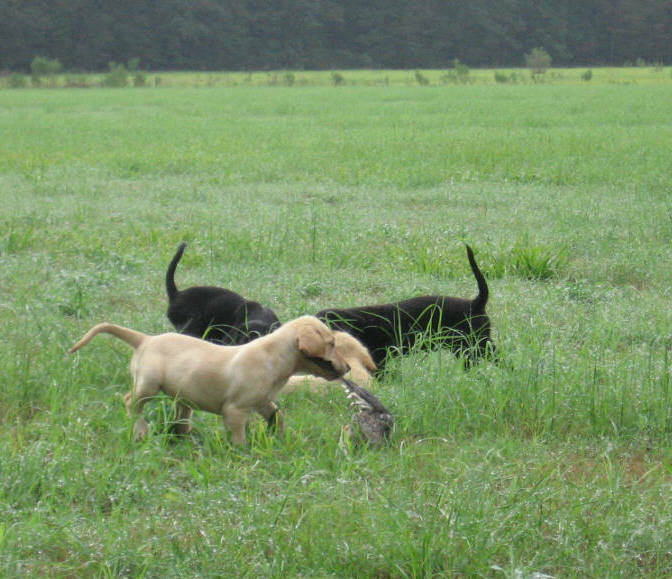 AKC Field Trials are "the elite" of the retriever games. Each trial has placements of 1st, 2nd, 3rd, 4th, Reserve Jam (which may move up if one of the placements is disqualified) and Jams (completed the trial). In order to be titled a Field Champion (FC), the dog must place first in at least one trial and accumilate a total of 10 points in the Open/Special/Limited/Retricted Stakes. 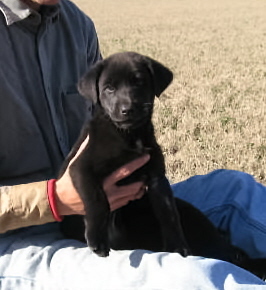 To be titled as an Amature Field Champion, the dog must be handled by an amature (a person who does not train retrievers for a living), the dog must have a win (first place) in either the Amature or Open stake, and accumilate at least 15 points while being handled by the amature. Any points earned in Open while handled by an amature will count towards the total Amature points. The "minor" stakes in a field trial are Qualifying and Derby. The Qualifying again has placements, it is used to "qualify" a dog for the "major stakes" and can be used to limit entries by requiring that the dog be "Qualified All Age" (Limited) and further retrictions depending on the stake. QAA is obtained by running and winning twice in the Qualifying stake or by placing or receiving a JAM in the Open or Amature. It is not our goal at the moment to train/handle client dogs for the major stakes (Open/Amature). This does not mean that your dog will not be competative, it just means that it is not our main focus as of right now. We do plan to run our dogs in the minor stakes (Qualifying and Derby) and would run client dogs in those stakes as well. All of our training programs include food and board for the dog as well as one-on-one and group training with the owner. The owner is responsible for providing heartworm preventative, flea treatment, and any other medicines as needed by the dog. If heartworm/flea treatments are not provided, we will have our vet prescribe these medicines including heartworm test if required and billed at cost to the owner. An additional fee of $25 applies to Cedar Swamp Retrievers for travel to the vet. Live Flyers, generally given once a week, are not included in the training prices below. They are currently billed at $15 each. Approximate duration of 6-8 weeks. The dog and owner will learn here, heel, sit, down, kennel. Dog will be reliable on leash for all commands, some commands may not be fully reliable off leash. Off-leash is a continuation of On-leash and covers all the commands learned in on-leash, but is proofed where the dog reliably performs the commands off leash. Includes introduction to basic obedience, introduction to retrieving, and crate training. Live flyers (ducks) are not normally shot for young puppies, but dead ducks will be used when the puppies large enough to pick them up. Basic gun dog normally takes approximately 4 months. The basic gun dog will be steady to shot, deliver birds to hand and started on multiple marks and basic handling. 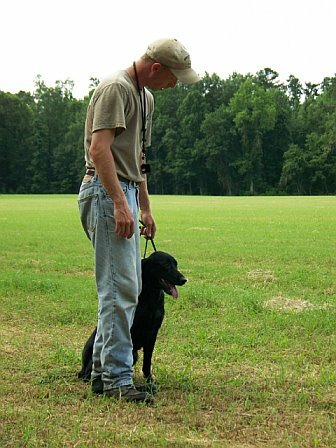 Advanced gun dog training generally takes 8+ months and covers multiple retrieves and running blind retrieves. Basic hunt test normally takes approximately 4 months. The basic gun dog will be steady to shot, deliver birds to hand and started on multiple marks and basic handling and will be ready to pass Junior Hunter/Started level tests. 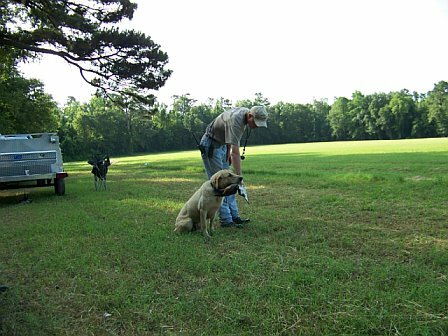 Advanced gun dog training generally takes 8+ months for Senior Hunter/Seasoned level and covers multiple retrieves and running blind retrieves. Master Hunter/Finished level generally takes 12+ months. Length of time depends upon the dog and its ability to learn. Some dogs are may not be able to perform advanced work well. In those cases, we will let you know as soon as we see a problem and let you decide on how to proceed. Entry fees are to be paid by the owner. Handling fees are charged for dogs run by CSR at a test. Available to puppies/dogs not in training with CSR and to anybody that would like assisted training with their dog. 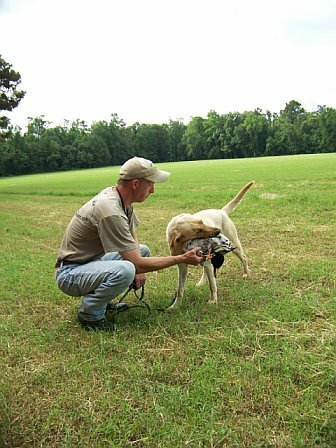 It will include obedience and retriever training, as a group and individually as needed. Please call for scheduled group days or to schedule an individual appointment.